If you have always wished to get stylishly trimmed stubble to woo all the ladies around you, Philips has just the trimmer for you. The QT4006 trimmer from the house of Philips puts the skill of a professional in your hands so that you can achieve those handsome looks without much ado. An advanced stubble and beard trimmer, Philips QT4006 comes with 20 length settings and precision of 0.5mm. This appliance features titanium coated blades and non-scratch teeth to give you a smooth trimming experience. IT have have been designer with red and black Multicoloured outside . Also, it has round tipped combs to prevent irritation after you are done with the trim on a particular area. With a rechargeable battery, this Philips trimmer gives you 90 minutes of cordless usage after being fully charged. Easy to use and handle, you can carry it on your tours and travels easily.0.5mm Precision. With the precision of 0.5mm, you can style your beard or have that star like stubble within minutes. 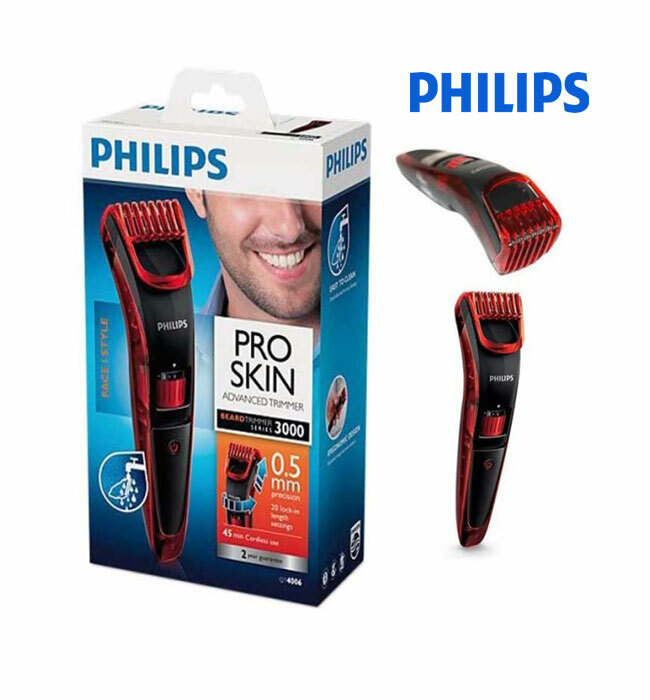 This Philips trimmer helps you don that perfect look you always wished for that too with a professional touch. There is a rotatable wheel on Philips QT4006 advanced stubble and beard trimmer. Simply rotate it to select length settings. From a 3 day 0.5 mm beard to a full grown beard of 10mm, it can efficiently trim it in 0.5mm steps. You can select the optimum length out of 20 options available and achieve a neat and smart look with this Philips appliance. Charge your Philips QT4006 advanced stubble and beard trimmer for an hour and get 90 minutes of cordless charging. You can also use it while it is plugged in if you are in a hurry and the trimmer is out of charge. Philips QT4006 is designed in a manner that lets you trim those hard to reach areas. It is very easy to use and comfortable to hold. 3)Outside Of Dhaka Delivery From SA Poribohon.